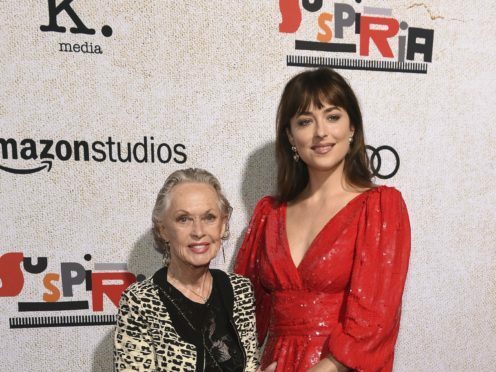 Dakota Johnson walked hand in hand with her grandmother and Hollywood royalty Tippi Hedren at the premiere of her latest film. Johnson, who is starring in horror movie Suspiria alongside Tilda Swinton and Chloe Grace Moretz, arrived alongside Hedren for the event in Los Angeles on Wednesday. The 29-year-old actress wore a red mini dress while her 88-year-old grandmother wore black trousers and a cheetah print jacket. They walked onto the red carpet in Hollywood holding hands before posing together for photographs. Hedren was discovered by revered director Alfred Hitchcock in the 1960s and went on to appear in two of his best-known films, The Birds and Marnie. She is the mother of another famous actress, Melanie Griffith, who in turn is Johnson’s mother. British actress Swinton and US star Moretz also posed on the red carpet. Moretz, 21 and who used to date Brooklyn Beckham, wore a flowing green and black dress with dark lipstick. Swinton, who has multiple roles in the film, including that of a male character, teamed baggy pink trousers with a black top. Swinton, 57, used prosthetics and make-up to pose as an old man in an elaborate hoax. She later explained she carried on with the stunt for “the sheer sake of fun above all”. Suspiria – a remake of Dario Argento’s 1977 original – centres on Johnson’s character, a young dancer who enrols in an all-female dance academy in Berlin only to discover it is run by a coven of witches.